As a leading provider of Telecom services, First ABS and First ABE must be must be able to support 20 year old analog voice systems as well as global UC in the cloud. In January of this year (2018) First American took its own internal operation “to the cloud”. All of our own employees are now running on a state of the art E-MetroTel Telephone Solution. First American is a proud channel partner of E-MetroTel telephony solutions and now we are also a user of their service. E-MetroTel, headquartered in Plano Texas, is a cost effective telephony and contact center solution targeted at the small and mid-enterprise market. • Perfect for companies with up to 5,000 users. • Perfect for companies that have legacy systems like Nortel who what to save money by replacing the core but reuse the handsets. • Perfect for companies who want a hosted “Cloud” solution where they pay for what they use on a subscription basis! The E-MetroTel UCX is a cost-effective SIP Based Unified Communications solution that helps customers extend the life of their existing IP, Digital or Analog and add new open standard SIP devices. Employees become more productive and collaborative by using new UC capabilities – while leveraging the existing telephony investments and reducing ongoing maintenance cost. With UCx Cloud First American team members can plug in Digital and IP phones into their internet router and use web browser for our PCs/smartphones. These end points communicate with our own First American UCx instance in the Cloud for voice, video, fax, conferencing. We get access to all of the features and applications for one price. It’s very simple—for all of our many remote U.S. office locations we can provide our team with a standard set of all-inclusive features. UCX delivers the latest Unified Communication features such as integrated mobility, Home working, Call Recording, Meet-Me Conferencing including support for SIP compliant telephones and cost effective SIP trunks. Never miss another call. Ensure all calls find you based on rules you create, using features like scheduler, simultaneous ringing and privileged lists. Don’t want customers to know you’re working from home? Make and receive calls on your mobile device, with the appearance of using your office phone. Host your own on-demand conference calls for both internal and external attendees, with all the features like conference recording and add or remove participants. It includes: Password-Protected Conference Bridges, Third-party dial-in through DID, Participant Management & Conference Recording. Interactive Voice Response offers several options to help ensure that your callers don’t get confused and trapped. Within each IVR, you can choose whether or not to allow your callers to dial an extension at any time. 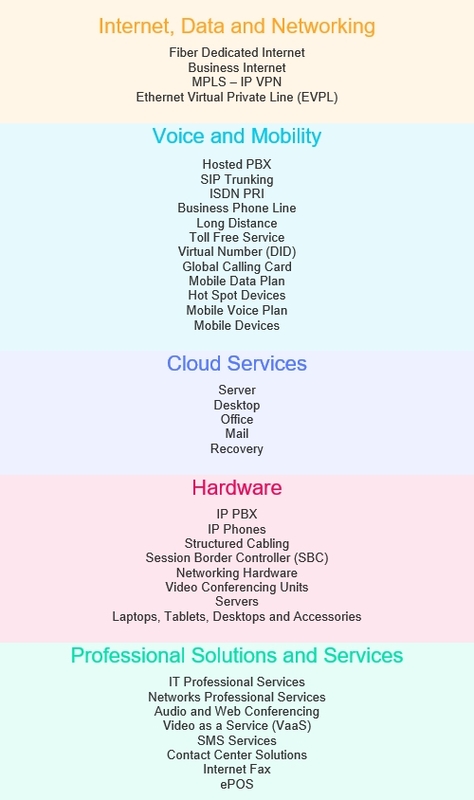 This is useful for creating different kinds of IVR experiences. Play a sound to the caller, then continue to the next action. This is for greetings, prompts, instructions, etc. Use the Sound Manager to record whatever sounds you want. Record Calls on Demand or all calls. Complete set of call records that are easy to access, browse and export. Set up recording of every call made or received on an extension-by-extension basis. Also you can create a rule that dialing a particular sequence in the course of a call (such as *1) will result in the call being recorded. Easy to configure and use yet highly effective contact center solution with advanced reporting. Minimize customer hold time by sending the caller to the agent that is properly trained to handle their query. Transfer callers who require specific handling in a certain area, such as technical support or sales, directly to agents. Keep the callers in queue if all agents are busy and provide choices to go to another group, supervisor or even have the system call them back. Simple flexible voice messages users retrieve from their hard client, Softphone, portal or even via email. Leave you a Voicemail message that can be sent to you as a .wav file to your favorite email client. Complete set of call records that are easy to access, browse and export. A log of all calls made including: source number; destination number; call duration, date and time. Full graphic reporting included as standard. WebRTC stands for Web Real-Time Communications, and the technology is focused on embedding real-time communications, such as voice, directly within web browsers. 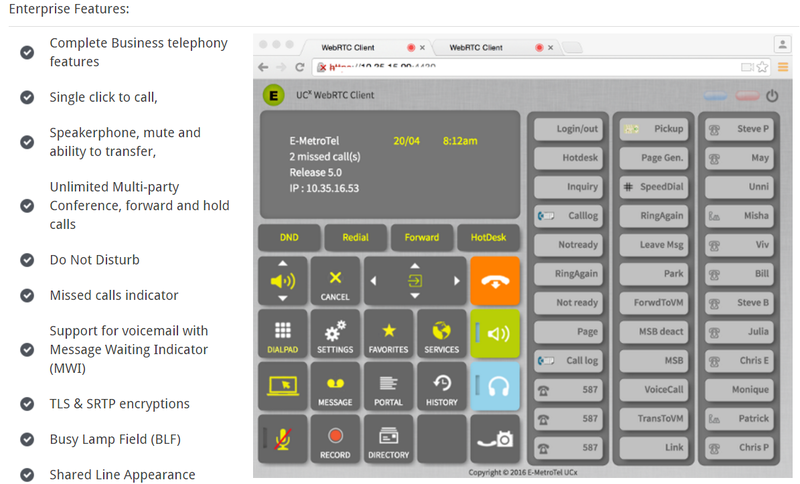 The WebRTC client that’s built into every UCX system allows you to use a simple web-interface on a laptop, desktop, tablet or smart phone. At First American we were looking for a cloud based phone system that could keep up with our rapid growth. We have employees throughout the United States and wanted a consistent and reliable interface for everyone. We also need and easy and quick way to bring on new employees and our new Cloud solution is a great fit for our operations. 2018 is off to a great start for First American Business, working with our current customer base and expanding quickly to meet the requirements of our new ones (see article below!). Our government sector is really picking up and seeing double digit growth rates. Segmenting our business 18 months ago into Enterprise (First ABE) and Government (First ABS) has really allowed us to focus our attention to each vertical which is starting to pay dividends now. It’s official. First American Business is now a CISCO partner. More details will be coming but wanted to let you know as we are excited about the potential this will bring. We did this because of demand from several of our key partners and several large opportunities in our pipeline. So in addition to our broad range of service offerings (dispatch, installation, maintenance, managed services, etc.) we are now authorized to sell products for Cisco, Oracle, Ribbon (Genband) and E-Metrol Tel. We are excited about adding Cisco to the mix and expect that part of our business to expand rapidly. As with any services business sometime a valued customer decides to move a different direction in terms of telecom support. One of our long term customers – Lakeland Ledger – has changed their telecom platform and so our support of their Nortel product has come to an end. We are lucky to have supported such a great customer and helped to make their transition to the new platform as seamless as possible. We certainly wish the Ledger team continued success. We have kicked off a new project this quarter to select a new ticketing system for our First American business. The current system works well but we are out growing it so hope to select and migrate to a new platform in 2018. In addition, First American Business will be migrating to Office 365 in 2018. Please note that this change will have an email address impact to our employees. Our customers and suppliers will be notified in advance of the rollout. Session Boarder Controller, Enterprise Operations Monitor, Enterprise Communications Broker and Oracles Interactive Session Recorder. In April we will host our first ever Employee Retreat. Our business model is structured virtually and although very effective it’s difficult to meet colleagues face to face. This Employee Retreat will allow us to meet in one location for a couple of days getting to know each other and discuss the state of the business. We are very excited and will share results in the next newsletter. LogMeIn, Inc. (Nasdaq:LOGM) today announced that it has entered into a definitive agreement to acquire Jive Communications, a leading provider of cloud-based phone systems and Unified Communications services and one of the fastest growing players in the Unified Communications-as-a-Service (UCaaS) space. LogMeIn (“Log Me In”) the company that offers conferencing services like GoToMeeting and join.me as well other online services to businesses, announced that it would acquire Jive Communications for $342 million in cash. The deal also includes up to $15 million based on reaching specific milestones. This announcement underscores how the telecom market continues to see a lot of consolidation. This is a solid offer for Jive Communications, a Utah-based startup that had raised only around $31 million since it was founded in 2006. The deal will add a suite of unified communications services that will complement and expand on LogMeIn’s existing collaboration products. Jive has 20,000 customers globally, LogMeIn said. Its primary focus is on VoIP for enterprises, and specifically hosted VoIP. In the enterprise market the big shift has been from legacy phone services to VoIP so players like Jive are making a lot of inroads as a result. Other competitors to Jive include services like UberConference, Zoom and WebEx. This deal will give Jive a lot more scale to grow its business. LogMeIn is significantly bigger in terms of market footprint with 25 million users, clocking seven million meetings, and over 900 million conferencing minutes each month. LogMeIn has been looking for more ways to expand the types of services that it’s providing to its existing user base, as a way to expand its overall revenues. Last summer, the company acquired an Israeli startup called Nanorep, which makes chatbots and other AI-based tools, for about $50 million. At the most recent AWS re:Invent conference Amazon announced the launched Alexa for Business. This is a fully managed service targeted at companies by allowing them to deploy Echo devices at scale throughout the workplace. The service will provided improved meeting experiences with a focus on communication and collaboration. Alexa for Business has (and will have) a strong ecosystem with: Cisco, Zoom and Polycom (with their in-room conferencing systems), RingCentral (for its cloud-based voice services), Microsoft (for Office 365 and on-premises Exchange servers), and Google. For example, the RingCentral Meetings for Alexa for Business integration is an example of how voice control will play in the conference room. Users will be able to ask Alexa to launch scheduled meetings. The Amazon for Business management service will map Echo devices to RingCentral Rooms systems for the assignment of Alexa Skills. The AWS system can respond when you say “Alexa, join my meeting.” The platform will also include Salesforce to answer questions about business performance, Concur to share business travel information, RingCentral for voicemail readings, SAP SuccessFactors for HR, and other third-party voice services for the enterprise. For voice-based commands outside the meeting room, RingCentral is integrating Alexa Skills with its communications app so that users will be able to ask Alexa to do things like play back and respond to voicemails; send and check SMS messages; and place outbound calls. Besides being able to configure conference room settings, a company’s technical department will be able to use the Alexa for Business service to do things like provision and manage shared Alexa devices, enable Alexa skills on an individual user and user group basis, and build custom skills through Amazon for Business APIs. Cisco: Cisco this week posted very solid earnings. While on the surface it didn’t look that good (flat revenue and earnings) is was much better than Wall Street expected so the stock went up. Shares of Cisco rallied on Thursday after they wowed Wall Street with better-than-expected earnings. Cisco said Wednesday that fiscal first-quarter adjusted earnings were 61 cents a share, flat vs. a year earlier, with revenue falling 2% to $12.1 billion. Cisco also said it expects 1 percent to 3 percent year-over-year revenue growth next quarter, the first inkling of an increase after 8 quarters of declines. The stock rose about 5 percent Thursday after about a dozen Wall Street analysts listed in FactSet raised their earnings expectations for Cisco going forward. Earlier this year Cisco stepped further into the Unified Communications and Telephony space with its acquisition of BroadSoft (BSFT). Mitel: Mitel just this quarter closed its $530 million acquisition of ShoreTel. The purchase marks one of the largest unified communications mergers in years, creating the No. Two (#2) player in the global UCaaS market. The UC market is transitioning to the cloud and there are very few on-premises UC vendors left. The new combined company is laser-focused on winning more deals and taking share from its two biggest UC cloud rivals: 8×8 and RingCentral. The acquisition will give Mitel annual sales of more than $1.31 billion, according to Ottawa, Canada-based Mitel, and will double Mitel’s UCass revenue to $263 million. The company is also targeting $60 million in cost synergies by 2019. Ribbon: Sonus has put the final touches on its merger with Genband, renaming the combined company under the new Ribbon Communications brand. Avaya: Avaya has filed paperwork earlier this month with the intention of coming out of Chapter 11 in December. They have announced a new Board of Directors and plan to issue stock on one of the stock exchanges. It appears most of the debt holders are in agreement with the restructured company’s plan on the debt with a key court date for possible approval at the end of November. If your network is down your business is down. Have you ever experienced the frustration of your business’s voice network being completely down? Your contact center? There are some companies who “react” to issues when they happen and there are some companies who are “proactive”. The companies who are not proactive generally believe it costs less than being proactive, however when you factor in the cost of down time and lost revenue that is not necessarily the case. To be proactive in managing your network, it is best to have eyes on your network at all times. Not just Monday – Friday 8 – 5, but truly on a 7×24 basis. Proactive monitoring, alarm generation and notification give you those “eyes” even when your staff is not there. If an outage happens to your voice network on Saturday and you are alerted and able to fix it over the weekend, think how much better that proactive solution is to showing up on Monday morning and then starting your trouble shooting while your business leaders are pressuring you for an answer. 2 – Giving you secure, simple access to that equipment from anywhere in the world. Our solution starts with connectivity to your remote site. The solution does this by having a small appliance at every customer location. The appliance is called an ENS and it has all the connectivity and logic to connect to any console. The device supplies access in one of two different ways: 1 – Via a Secure Access Link Tunnel (SALT) through the remote firewall and back to your central location, or 2 – via Modem. First American’s solution is “Device Agnostic”. As long as the device at the customer’s site has some mechanism for communicating that it is unhappy, we can monitor it. First American monitoring gives you what you need the most: knowing that there is something wrong with the systems, knowing it before the business user might even know it, and having the ability to fix the issue from anywhere before it has a serious impact on the business’s operations. 7×24 NOC support from First American Tier III engineers: Tier III engineers with Lee, Steve and Sean have certifications and are skilled engineers covering ALL Blue and most red systems and applications. Also John (Tier III) and Norm (Tier II) provide SL100 and CS2100 support followed by Tick and Dave (both Tier III) and others. It is hard to express our appreciation for the amazing work you have done. Thank you all for the endless hours that each of you spent/are spending working nights and weekends for the past two years – benching, data gathering, end user training, deploying phones, installing switches, installing gateways, FDOB support, adds, moves, changes, ordering, tracking and shipping hardware, etc. Challenges have been numerus – and your ability to adapt to the constant change in procedures has been outstanding. The dedication, professionalism and team effort that each of you have shown has been immensely impressive. Congratulations on a job well done! Lauren, your diligence, dedication and ownership has been a source of inspiration for everyone on the team. You and Lin have done an outstanding job in keeping the wheels turning and on track for two years – processing 270 Cisco orders – managing and storing HW – plus weekly deliveries; 167 Avaya orders, and 167 site travel arrangements/expenses, managing and delivering billing on time – it’s been absolutely crazy – and not once did we have a travel hiccup or major invoice delay. Thank you all for your efforts and for an outstanding job. Wishing everyone the best for exciting times ahead. I am looking forward to our next endeavor together. # of systems reverted back to the old system – zero! As a leading provider of international carrier services, Convergia offers a comprehensive portfolio of quality managed services, while focusing on customer needs and providing reliable business solutions. 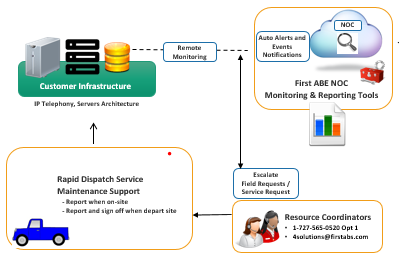 First American Business (ABE and ABS), as a leading Enterprise and Government provider of nationwide dispatch technicians, installation engineers, and training around voice & contact center support services, offers a tactical complement. Wholesale SMS bulk and two way SMS messaging service. If your network is down your business is down. Have you ever experienced the frustration of your business’s voice network being completely down? Your contact center? On one hand it is a nice feeling “hey, my phone is not ringing so I can get a lot of work done”. Then it dawns on you… your customers can’t call you; they get frustrated; they start to think about alternatives to doing business with your company! There are some companies who “react” to issues when they happen and there are some companies who are “proactive”. The companies who are not proactive generally believe it costs less than being proactive, however when you factor in the cost of down time and lost revenue that is not necessarily the case. Giving you secure, simple access to that equipment from anywhere in the world.